One of the biggest turning points for Kia was the introduction to the newly designed optima in 2010. Since then, the Optima has been known for both luxury and value. 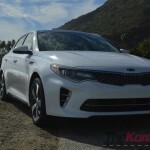 Kia continues to improve and provide that same feel with their redesigned 2016 Optima that although looks similar, it is pretty different from its predecessors. 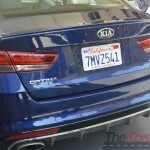 Although the Optima looks similar to the earlier models, it has been upgraded in several different areas. Beginning with the chassis of the car, the overall body is now over 50% constructed of high strength steel, giving the car a 150% increase in driving dynamics, crash protection, and quieter ride. Furthermore, the increase in high strength steel adds 58% more torsional rigidity meaning a longer lasting chassis and quicker response. On the suspension side Kia upgraded to dual lower controls arms for better stability and turning response. Furthermore, they optimized the suspension geometry by making it more vertical allowing for more suspension travel, which is more comfortable in uneven pavement. Kia also offered two different steering racks for better handling, feedback, and overall performance. One is a column mounted type that comes standard and a rack mounted type that is exclusive to the 2.0 turbo models. 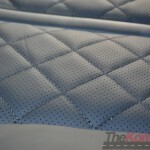 Kia did not only add major improvements to the structure, but also to their interior with diamond stitch seating in the SX Limited as well as a red leather trim in their Launch edition. The new Optimas are also roomier with 45.4 inches of front leg room, 40.1 inches of head room and 15.9 cubic feet of cargo volume. Other luxurious features include quilted Napa leather seating, and multi way power adjustable seating for both driver and passenger. 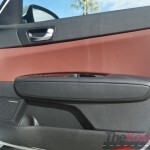 Kia also invested heavily on the audio by installing a Harman Kardon premium 14 speaker sound system. Harman Kardon is generally found in the most luxurious cars and to offer this kind of sounds to the Optima is a real plus. Kia took it a step further by installing quantum logic surround sound which offers the clearest and most refined sound when playing music. The system literally makes you feel like you’re in a theater by hearing balanced and smooth sounds from all directions. 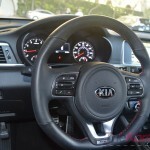 Kia added some very impressive tech in the across all trim models especially in the SX Limited. The most appealing features where the near semi-autonomous driving system that not only detected other vehicles nearby but also adjusted its cruise control to match the front car’s speed without any additional driver input. Another impressive feature was their multi-camera view that gave the driver view of the front, rear, and sides of the vehicle making parking so much easier. Other features include Autonomous emergency braking system with pedestrian detection along with forward collision warning. 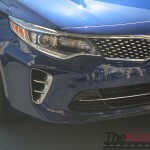 In their lighting department Kia added Bi-Xenon HID dynamic bending headlights which will definitely offer better vision at night especially in blind turns. 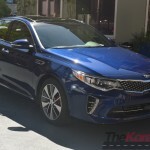 Driving the Optima was a very interesting experience since I’ve driven The Rio and Forte Koup Turbo offering a better comparison between models. 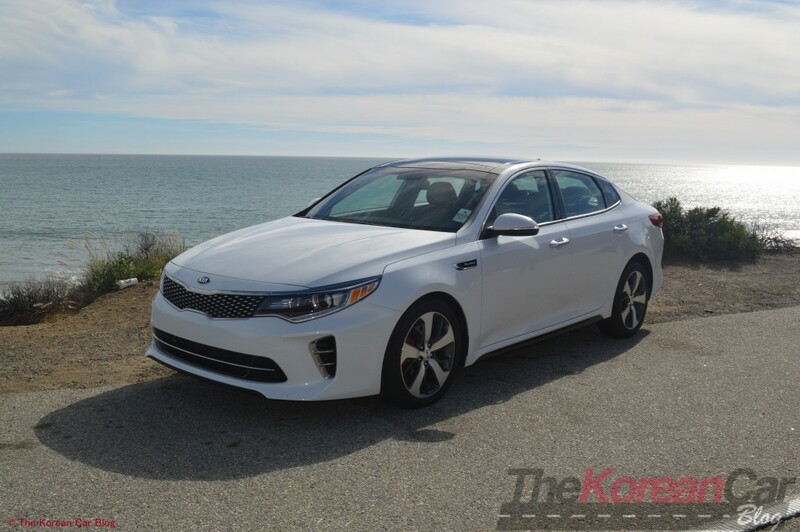 The Optima SX offers what I could best describe as the best of both worlds in performance and economy but with much more refinement in luxury and comfort. 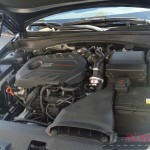 The 2.0 Turbo GDi motor gives the right amount of power but with more grunt as compared to the 1.6 Turbo GDi. With the added displacement there is a bit more of a fun factor since the performance mapping changes when going into sport mode along with the steering wheel giving more feedback. The handling was a pleasant surprise because although it is a relatively big car, the handling was deceivingly good. Normally there is always a compromise between performance and comfort in the suspension area. Either it’s comfortable but turns like boat, or handles great but rough in uneven roads and general commuting. 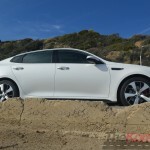 In the Optima, Kia seems to have found the sweet spot by the car being comfortable on different roads perhaps due to the added travel gained from the change in suspension geometry. On the other side the car handles very well encouraging a more spirited drive through twisty roads which I’m sure the independent rear suspension and possibly upgraded sway bars have something to do with it. Using the sport mode was a novel a feature that changed the power delivery to higher torque and lower RPMs so the car can break traction in certain off camber turns. During sport mode the steering wheel becomes harder and more feedback is delivered however I feel that “sport mode” may need a little more than just a small map change and harder steering wheel. If I were to add another factor it would be a muffler bypass valve on the exhaust so the driver could hear the 2.0 scream at high RPMs. In my opinion, part of the enjoyment of a sporty mode is the exhaust sound. I feel that minor change would really show a driver what “sport mode” is in any car. In handling the creature comforts one of the most interesting parts of the drive was the cruise control. Because, it will take into account the front car’s speed and adjust accordingly but the distance seemed a little too far which gave other cars the incentive to change into my lane. Although the feature is very nice when going on long trips with no traffic, it can be a little cumbersome if it continues to give a large enough gap where people are more likely to cut you off. On high to medium traffic situations I would rather drive the car myself so as not be continually pushed back in traffic. In the visuals, the Optima without the fog lights seem to look more like an executive sedan, similar to the Lexus LS model and although it looks more upscale it has lost some of the “sportiness” that the previous predecessors had. 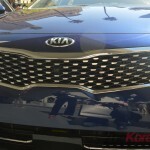 This could mean Kia is focusing at a more professional crowd and saving the sporty visuals for the Forte models. 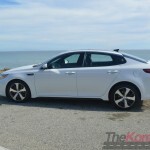 Overall, the new Kia Optima is a well-built Korean machine. In experiencing the SX model I could only think about what kind of person would buy this model. In a sense this is a well-rounded car for just about anyone. 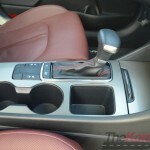 I think of good family car similar to the Toyota Camry but with much more styling because of the amount of room inside. On the other hand, it’s performance, handling and interior make me think of the mature professional that would typically drive an Audi A4, or BMW 3-Searies Sedan. 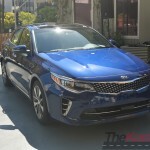 In conclusion the car was exceptional in price starting at $21,990 and value, I was left impressed after driving it for over 1,500 miles in both city and long distances at how well refined the Optima is. 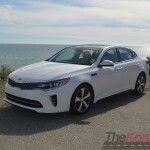 I’ll be curious to see what Kia will do next to further improve the Optima.